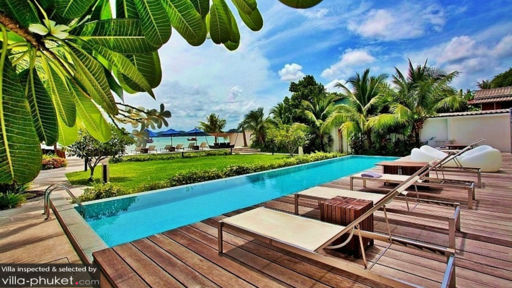 Sky Box is a luxurious penthouse found on the renowned 'Millionaire’s Row' in Bang Tao beach, with a splendid view of the ocean from its two bedrooms, this spectacular property caters to guests traveling to Phuket for a tropical adventure. Overlooking the Andaman Sea, the penthouse has the perfect location offering guests easy access to nearby Surin beach which is merely 5 minutes away. With elegant decor featuring light wood furnishings, warm lighting, and large open spaces, the penthouse provides a restful sanctuary where guests can relax, replenish, and rejuvenate! The two bedroom suites are awe-inspiring and will leave you speechless once you enter through the doors. With TVs and DVD players, the bedrooms afford you the luxury of endless views through their massive glass windows. The master bedroom is adjoined to a private balcony with a Jacuzzi attached to the en-suite bathroom with a mesmerising backdrop and a romantic vibe. Both bedrooms are furnished with king-sized beds for the best sleep of your life. 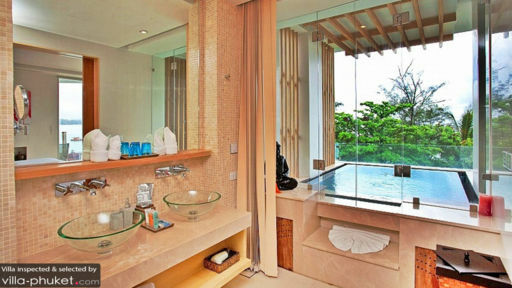 The second bathroom is fitted with a walk-in shower area. Located right on Bang Tao beach, touching corners with the Andaman Sea, you are spoilt for choice when it comes to outdoor activities. Head to the beach for sunbathing, snorkelling, diving or explore the two infinity swimming pools in the boutique building where you can swim laps, play water volly, or simply lounge to your own rhythm. A private Jacuzzi nestled on the balcony adjoining the living area is the perfect spot for a chill vibe with a drink in hand as you gaze at the horizon, enjoying the calming ambiance. The pool deck is furnished with sun loungers and alfresco sitting make the most of the gorgeous view in front of you! A stunning living space encompasses almost an entire floor with floor-to-ceiling glass windows, giving you a 180-view of the Andaman Sea and clear blue skies. Furnished with uber comfortable sofas sat facing the ocean, the living room is a great common area for everyone to mingle. The air-conditioned room features light wood flooring which makes it look all the more spacious and open. Once the sun sets, the view charms its way into your heart with cotton candy skies and a drowsy ambiance. Aesthetics are minimal, vibrant, and warm so you feel at home in the penthouse. The dining area and kitchen are located towards the back of the living area with a six-seater wooden dining table. The open-kitchen is fully-equipped with state-of-the-art facilities and appliances for your culinary use. The island breakfast bar is accompanied by barstools as well. There are numerous activities for you to engage in around the villa including horseback riding along the shore, excursions, and tours of the nearby beaches. There is a fitness room, fully-equipped with various machines for your use An outdoor grill is great for a BBQ with friends and family. If you wish, the chef can even prepare some delicious local delights. Housekeeping, in-house massage, concierge and daily maid service are available. 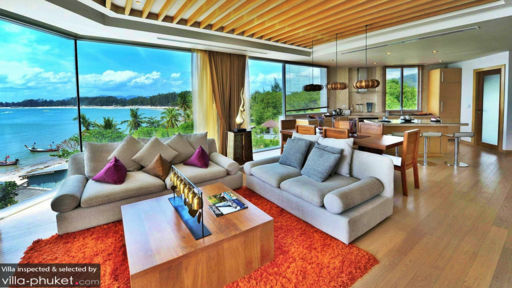 Surin beach is five minutes from the penthouse and Patong beach is merely 20-minutes by car. Bang Tao beach is a great spot to indulge in watersports and activities including snorkelling, diving, and even fishing. As you’re closer to the beach, you can simply walk down and lounge on the sandy shores. Explore Surin and other nearby beaches with tours to see more of Phuket. Spectacular views, friendly service . What else can you ask? The moment you walk into this very beautifully designed and decorated penthouse and you see the breathtaking views you know you are in for a treat. Much better than pictures really. Stunning pool and a great private jacuzzi in the balcony. Very helpful staff and a very friendly owner. Best place we stayed for long time and we are kind of spoiled:) Definitely coming back!